Light from a distant galaxy forms a ring as it is bent by gravity around a galaxy that is closer to us - image credit: NASA Hubble Space Telescope. Consider a planet that is shaped like a sheet of foam board, several thousands of kilometers thick and extending flat for say a million kilometres in each direction. In reality, a planet of this shape and size could not exist as it would simply collapse under its own gravity into a sphere. However, for the purposes of this thought experiment assume it is made of sufficiently strong material to resist such a fate. Assume also that the planet is just the right density and thickness so that the acceleration due to gravity at its surface is g, the same as that on the earth. On this planet a laser is set up on a platform with its axis parallel to the surface of the flat planet (as shown in the lower diagram to the left). At the same elevation above the ground as the laser, a 1 kg weight is suspended. 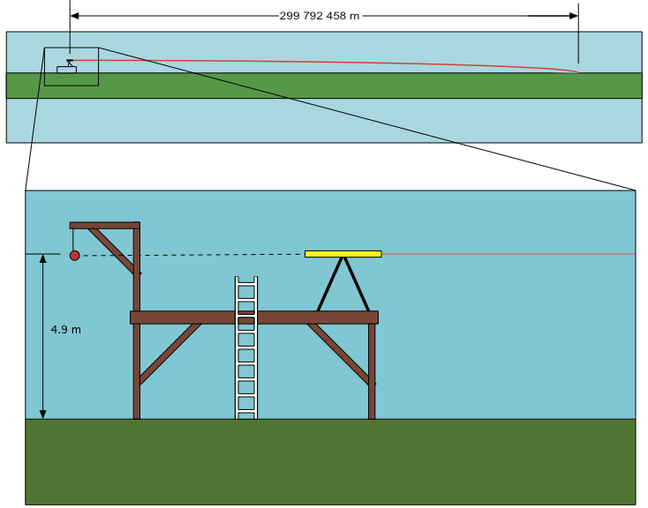 If the elevation of the weight (and the laser) is 4.9 m it will take the weight 1 second to hit the ground after it is released. In this experiment, at the same time as the weight is released a pulse is flashed from the laser. Even though light has no mass, photons are 'affectred' by a gravitational field. So, in addition to their horizontal trajectory, they will also accelerate vertically downward at the same rate as the dropped weight. Since the ball and the photons are under the same gravitational influence and 'fall' at the same rate, they will both hit the ground at the exact same time, 1 second later. The only difference is that the laser will hit the ground 299,792,458 m from the platform, the horizontal distance that the light will have traveled in the 1 second before hitting the ground.